Offering you a complete choice of products which include digital vibration meter, electronic vibration meter, vibration meter calibration, vibration meter, portable vibration meter and acd vibration meter. All machines with rotating parts vibrate. Maximum performance is obtained when these vibrations are kept within the specified limits. For this purpose periodic check known as preventive maintenance program becomes necessary. The Vibration Meter manufactured by ACD is primarily intended for improving the performance of rotating machines by monitoring and logging the vibration levels. 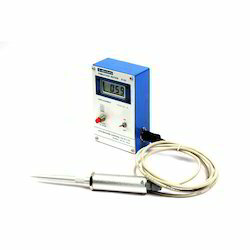 Piezo electric Transducer is the most sensitive of its kind available today. It has a built in mechanical filter which eliminates all unwanted frequencies including Audio Pickups. Inverted mass construction, makes it unique, and extends usefulness upto 60,000 R.P.M. with out loosing the sensitivity. 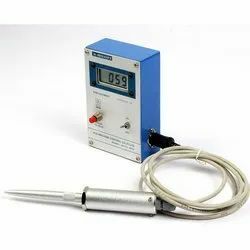 Hand held sensor incorporates transducer with a signal conditioner and 8 db/octave filter, which cuts off all the unwanted signals and improves signal to noise ratio. Model D – 83 reads DISPLACEMENT of Vibration in Microns pk -pk. However, to decide severity or acceptance level of Vibrations from Displacement, one has to know the operating speed. Model D 93, apart from ‘DISPLACEMENT ‘ also reads ‘VELOCITY’ of Vibration in mm/sec pk This reading is obtained by differen tiating ‘DISPLACEMENT ‘with reference to the frequency, Hence, it directly denotes the severity and one does not need to refer to the operating speed to decide the acceptance level. Piezo electric Transducer is the most sensitive of its kind available today. It has a built in mechanical filter which eliminates all unwanted frequencies including Audio Pick - ups. Inverted mass construction, makes it unique, and extends usefulness upto 60,000 R.P.M. with out loosing the sensitivity. Model D 93, apart from ‘Displacement ‘ also reads ‘Velocity’ of Vibration in mm/sec pk This reading is obtained by differentiating ‘Displacement‘ with reference to the frequency, Hence, it directly denotes the severity and one does not need to refer to the operating speed to decide the acceptance level. Model D 93, apart from ‘Displacement ‘ also reads ‘Velocity’ of Vibration in mm/sec pk This reading is obtained by differen tiating ‘Displacement‘ with reference to the frequency, Hence, it directly denotes the severity and one does not need to refer to the operating speed to decide the acceptance level. Model D 93, apart from ‘Displacement‘ also reads ‘Velocity’ of Vibration in mm/sec pk This reading is obtained by differentiating ‘Displacement‘ with reference to the frequency, Hence, it directly denotes the severity and one does not need to refer to the operating speed to decide the acceptance level. We are successfully meeting the requirements of our clients by offering the best quality range of Vibration Monitor. 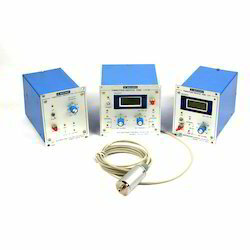 Used to measure vibrations and oscillations in many machines and installations.